At first I thought it was a joke when I received an order for a Starlette Crown from the tattoo starlette herself, Kat Von D, but it was absolutely a sure thing. After screaming at the top of my lungs, I made the piece + sent it out to her tattoo studio, High Voltage in Los Angeles, along with a Starlette Sparkler for good measure. 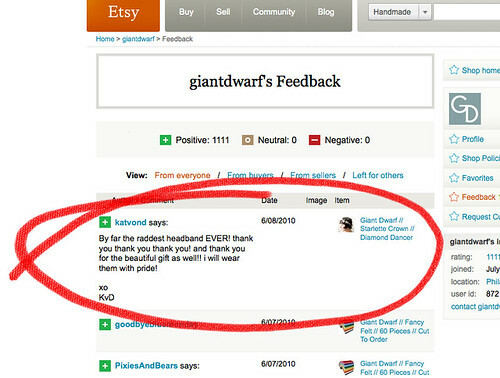 Still overjoyed from the order a week to the day, Kat graciously left the most amazing Etsy feedback on top of everything, which sent me over the edge. I wonder if she'll wear the sparkly crown of stars that I made on her show, L.A. Ink one day or maybe to an event. Heaven only knows + time will only tell, but my fingers are crossed that she will! WOW! That's like almost the coolest thing ever! I don't even know what I would do. Probably a little squealing dance or something crazy... Love your work! and I'm following your blog now. Believe it or not, I found you through pinterest... I'm addicted!